‘Tis the season for pesto, friends! As much as I love the kale pesto I shared with you yesterday, the basil plants are in full bloom and are practically begging to be to made into something delicious. I figured this pizza would be the perfect place to start. Hopefully you’re not on one of those avoid-all-the-carbs diets because really, that’s just not necessary. Pizza is necessary. We need carbohydrates to give us energy and to help our bodies function properly. 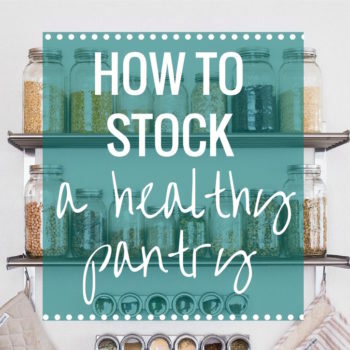 As long as we’re eating the right kind of carbs (read: whole grains) and staying fairly active, then all is right in the world. So, say it with me: thou shall not fear the pizza. Especially not one topped with sundried tomato pesto. It’s love at first bite. I have to admit, I’m not always a fan of sundried tomatoes because of the texture. They can be chewy almost like beef jerky which weirds me out a little. But I absolutely love the flavor. The solution to that problem? 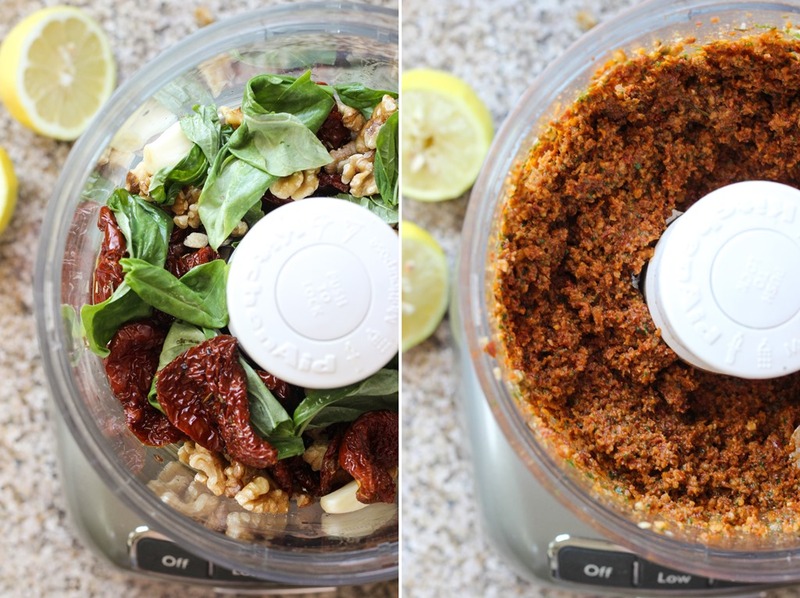 Sundried tomato pesto. 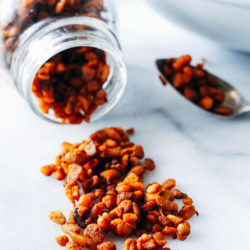 Just five ingredients and a food processor is all you need to whip it up. That way you get all the flavor without any chewiness. I like to make this pizza using a store-bought whole grain pizza crust (like Trader Joes) so that it comes together super quick. 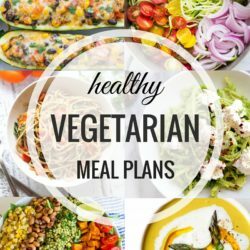 You can pair it with a side salad for an easy weeknight meal that takes less than 30 minutes to make. That’s what I like to call summer perfection. Preheat the oven to 450°F. Lightly dust a sheet of parchment paper with flour then roll out the prepared pizza dough into a 12-inch circle. Prepare the pesto by placing the sundried tomatoes, basil, lemon juice, walnuts and garlic in a food processor. Add about 1/4 cup of the oil from the jar that the sundried tomatoes were marinating in then blend everything together until finely chopped. In a small bowl, combine the sliced zucchini and corn. Top with high heat oil and toss until evenly coated. 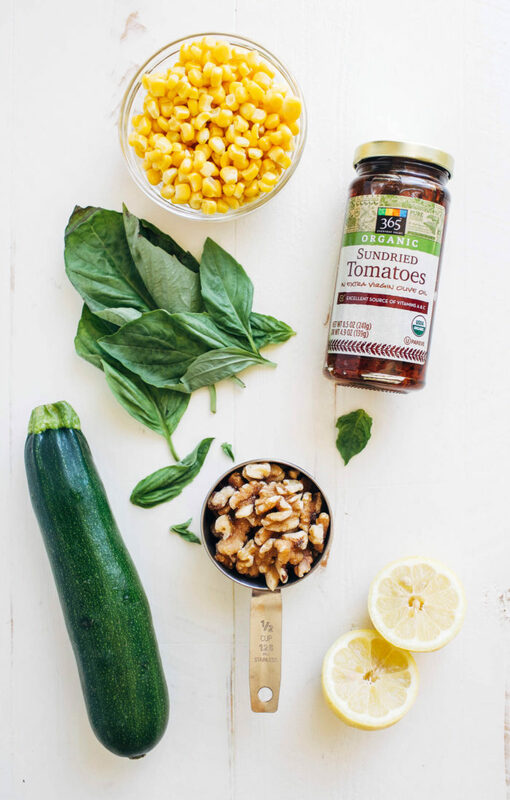 Spread the pesto on top of the prepared pizza dough then top with the zucchini and corn. Sprinkle with cheese and bake in the oven for 10-12 minutes, until edges are light golden brown. Allow to cool for 5 minutes before slicing and serving. 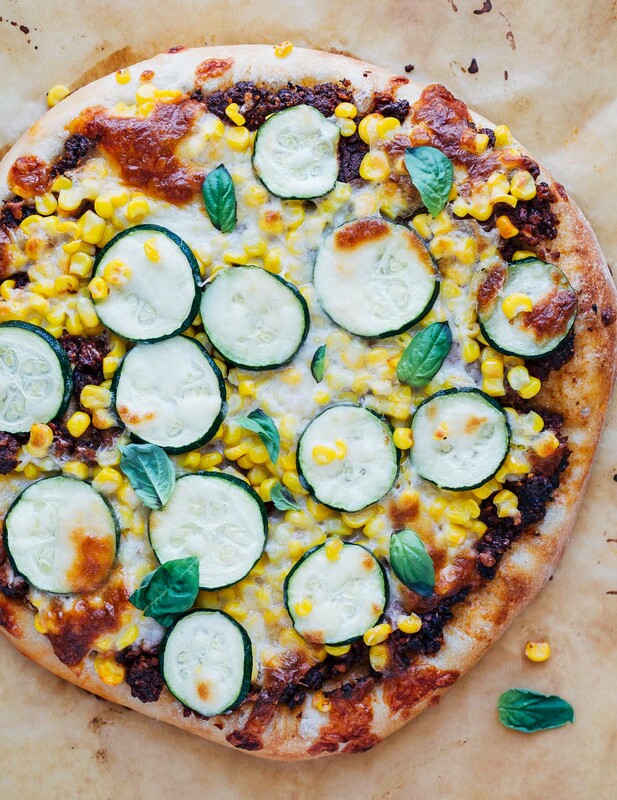 In the past few weeks I have 1) purchased a basil plant, and 2) discovered a fabulous pizza crust mix at whole foods, add in my obsession with corn and zucchini and I am super excited to try this pizza!! I still haven’t tried the pesto pizza thing – I’ll have to get on that! Especially with sundried tomatoes involved. Haha pizza IS so necessary–thank you for confirming that :) Also-glad we’re both on the corn train today! I LOVE pesto pizza! And I love what you’ve done with the corn and walnuts! This looks so yummy. 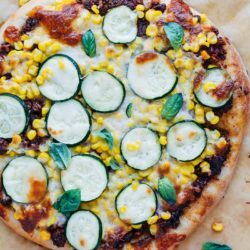 I just made How Sweet It Is corn & zucchini pizza last night and it was tasty but definitely missing something — that sundried tomato pesto! I need to combine the 2 recipes and add fresh mozzarella to yours. MMM…. 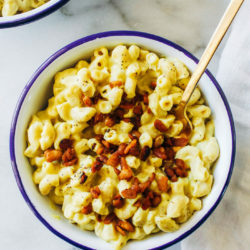 That looks sooo delicious, can´t wait to make it! Pesto pizza is amazing! 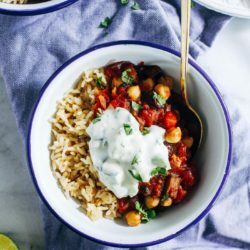 I love the idea of adding in some sundried tomatoes to the tomatoes. They’re so, so flavorful! Low carb or no carb diets straight up piss me off. Yes, limiting intake of carbs is fine and dandy, but keeping them to a bare minimum just makes you a mean ol’ sonofabeehive if you ask me. No one wants to see me when I’m carb deficient. Nobody deserves that. This Pizza…..I can get down with it any day of the week. Sun-dried tomato pesto? You’re speaking to my heart strings, girl!! 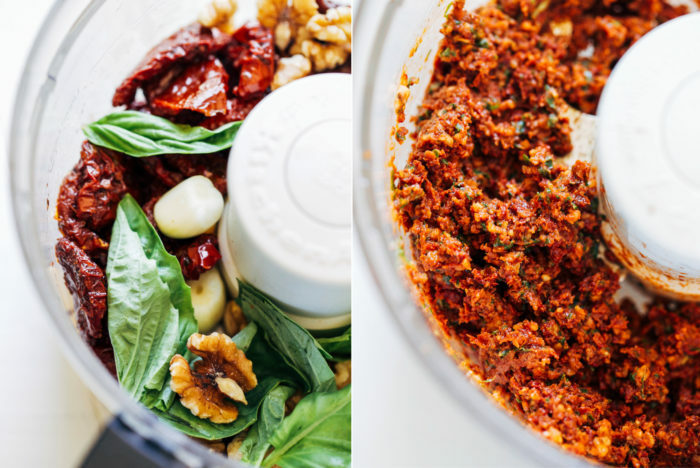 Sundried tomato pesto has been on my to-make list for a while, and this is just the inspiration I need to finally make it happen! This looks like pure summer bliss. YES to pizza being 100% necessary! And I love the simple combination of flavors you’ve got going here! Your pictures look divine and I would like 5 slices delivered to my door for lunch, please ;). Carbs are important and whole grain ones are the best. Do you have any recommendations for the best whole grain pizza dough around? I’d love to try this! My husband and I haven’t made pizza at home in a while. Sounds delicious! I love pizza and make it all the time. My basil plant is flourishing quite nicely right now, and the smell of basil is just heavenly right?! My basil plant is so full and I am so ready to make pesto. I love the addition of the sundries tomatoes. I definitely need to try this recipe. I totally agree: pizza is absolutely necessary! I’ve never had sundried tomato pesto. Now I have to have it and this pizza! I love this fresh variation. 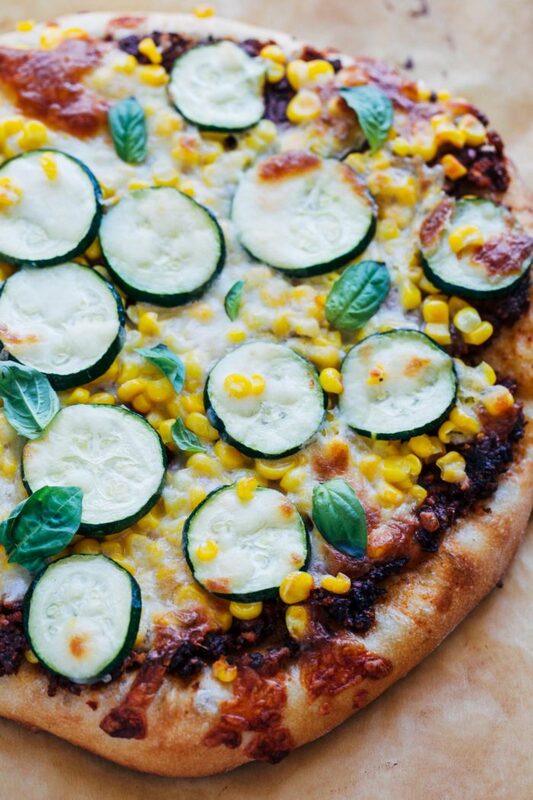 Oh man… I love pizza and I like that your taking all the tastes of Summer veggies and putting it together. I’m a little off with sun dried tomatoes too but this I can “get down with”!!!! I am loving all things pesto right now! This pizza is perfection. Pizza is definitely necessary and this is one that I can definitely get down with! I love that you used the sundried tomatoes to make pesto and with the corn and zucchini… so good! ooh this pizza looks delicious.. definitely craving a slice right now. 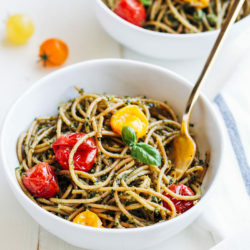 Thanks for the recipe – I love how colorful it looks, and pesto is definitely one of my favorite sauces – especially in the spring/summer. I honestly couldn’t imagine life without carbs. Or pizza <3 And I love that you put corn on top! I used to think it was a little odd, but then I tried it and there's no going back. 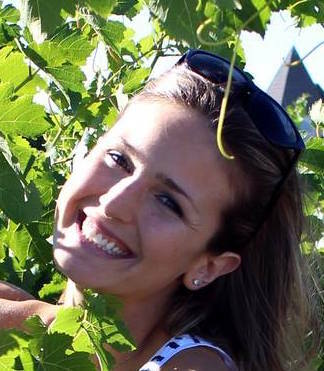 Your pics are gorgeous, lady! First off, YES pizza! haha. And Yes to TJs whole grain pizza crust. It’s been a staple in our house many times and I’m so obsessed. Whoever said pizza was bad for you had no idea what they were talking about! Lovely pizza recipe Sarah. It’s really nice that you have used zucchini in it. Thanks for sharing. This was a delicious pizza recipe and a much healthier alternative than the others available. Thank you for sharing and my children thank you also because they loved the sauce.